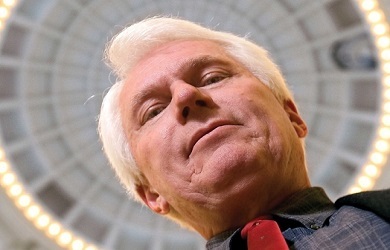 As we have noted several times before, American Family Radio’s Bryan Fischer has an understanding of the First Amendment that makes absolutely no sense, as he regularly insists that it only applies to Congress … except for all the times when he insists that it applies to all sorts of government entities. Fischer’s incoherence has been on full display regarding the case of Joe Kennedy, a high school football coach from Washington state who was fired after he refused to stop praying with players and students after games. Despite the fact that Fischer has repeatedly declared that “it is constitutionally and historically impossible for a school to violate the First Amendment … [b]ecause a school is not Congress,” he simultaneously insists that the school district has violated Kennedy’s First Amendment rights by not allowing him to pray after games. The very first word in the First Amendment is “Congress.” The First Amendment was intended as a restraint on Congress and Congress alone. It is simply impossible for any other entity – be it a state, a county, a city, a school district, a school teacher, or a student – to violate the First Amendment for the simple reason that it wasn’t written to restrain them. Only Congress can violate the Founders’ Constitution, and it can do so in only two ways. First, it can violate the Establishment Clause by picking one Christian denomination and making it the official church of the United States. As long as Congress doesn’t do that, it can do anything it wants with regard to religious expression. It can pay a chaplain to pray Christian prayers and proclaim as many national days of prayer as it would like. States under the Founders’ Constitution are free to regulate religious expression in any way they would like without any interference from the federal government. States can even have an established religion if they want to, and at the time of the Founding, 10 of them did. Secondly, only Congress can violate the Free Exercise clause because it applies specifically and exclusively to Congress. Congress – and by extension the entire federal government, including the judiciary – is flatly prohibited from interfering with the free exercise of the Christian religion in any way, shape or form. Any such effort on the part of any branch of the federal government, whether it’s the legislative branch, the executive branch, or the judicial branch, is flatly and permanently forbidden by the Founders’ Constitution. The federal government has zero authority to tell schools what they may and may not do with regard to Bible reading in classrooms, prayer at assemblies and graduation ceremonies, or the posting of the Ten Commandments on school room walls. Those matters are for state and local authorities to decide. Period. Just last month, Fischer accused the Bremerton School District of violating the First Amendment, but today, he stated that it is “impossible” for a school district to ever violate the First Amendment. Under Fischer’s own argument, any state would be free to prohibit Kennedy or anyone else from exercising their religion for any reason, or, for that matter, to restrict the freedom of speech, freedom of the press or the right to peaceably assemble, which are also protected by the First Amendment. Fischer’s outrage over the Kennedy case proves that he clearly does’t believe, or possibly doesn’t even understand, his own stated position.